Sava Tatić became Managing Director of Sourcefabric after leading the development of digital technology solutions for news media at Media Development Loan Fund's Center for Advanced Media-Prague (CAMP). We promote Superdesk as a newsroom, or the digital expression of a physical newsroom. Journalists using it like the control it gives them over their workflows; being able to create desks on the fly for special events or big breaking news ­all without having to call IT. So far, so good. But that was yesterday's news. We work with journalists, so knew that they’d like to create bespoke trims, stylings and finishes, too. Okay, so that pushes the furniture metaphor too far: what we mean is that journalists should be able to define and edit content structure. That’s why we are excited to share the second-ever public release, and the first stable release candidate version: Superdesk 1.0 rc1. Superdesk 1.0 rc1 introduces content profiles management, an easy-to-use user interface that allows you to create and edit content profiles. A content profile in Superdesk is the definition of the structure for a news item. Suppose your newsroom writes different types of stories: flashes, long-form, regular articles, etc. A flash would consist of a very simple piece of content with a headline and a body; it would not contain a lot of metadata. The content is sent out to consumers to quickly alert them about certain events. On the other hand, long-form stories are composed of rich metadata and several content fields: headline, abstract, featured media (image, video) and body. With the new content profiles management your newsroom can define these profiles easily. You can set minimum and maximum values for headlines, captions and any text fields - and determine which format options are available for each one. You can state whether these fields are necessary for validation, or merely optional. Such attributes may be defined for each content profile. In a simple example, let’s say that one type of text­ and ­image story has a headline of 80 characters, a secondary strap of 180 characters with byline underneath, a picture of 800px by 600px, and body text. Let’s say that this recipe isn’t quite suited to what editorial, or a customer, wants to do with a certain style of article. They want a picture of 750px by 450px. Also, they want to increase the headline ­count maximum to 120 characters, tweak the strap, perhaps add a video, and the byline needs to be at the end of the text rather than under the headline — you get the drift. This means altering the skeletal structure on which the content is laid out, the data schema. 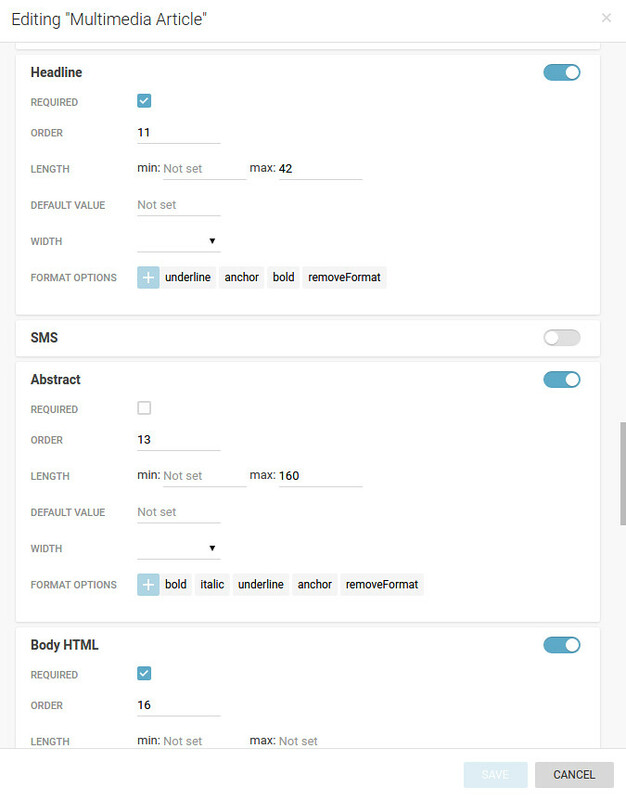 This is a database admin task or, in other cases, a developer task, or it was until we gave journalists a tool to set picture sizes and so on, and we’ve supplemented that with this UI for journalists to edit “content profiles” themselves. This scenario, and it’s common enough, does nothing for relations between editorial and their systems, dev and IT teams — people who have more important work to do than edit database fields over and over. Using Superdesk’s UI is straightforward. You can now make as many content profiles as you like, and edit them as often as is necessary. Save your tech operators time and frustration; let them get on with jobs involving real coding or geekery. That’s what they joined up for, that’s where their value lies. Software updates are not only about changes to the source code but, frequently, also about data changes. As we continue to release new Superdesk versions, they may include changes to data models, default configuration data, etc. In the same way, a running production instance of Superdesk contains application data and the news content created by the newsroom. To ensure that upgrading Superdesk to a new version will not harm both the existing application data and the news content when applying data changes that are part of the upgrade, we have introduced a mechanism to handle this in a safe way. Data updates and schema migration allows developers to easily write routines that will run during upgrade time to guarantee the database will remain consistent. This sounds less than thrilling, we know, but trust us when we say that is is an extremely important and valuable improvement to the platform. 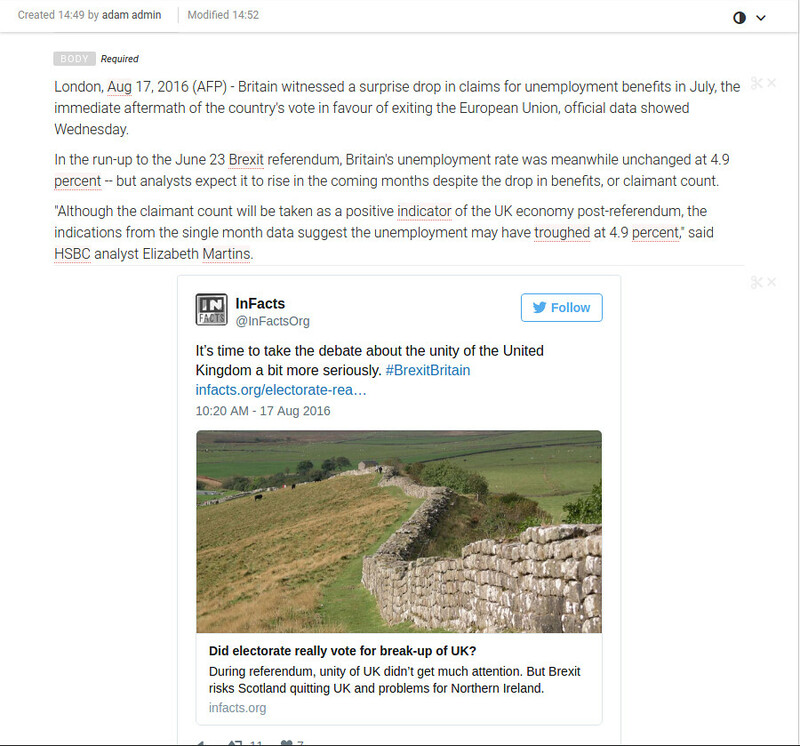 The Superdesk content editor allows journalists to combine text with different media assets (e.g. images, videos) including social media embeds. This content editor has just received an upgrade. You can now sort the different content blocks in a much easier way by performing a selection and then cutting and pasting the block to any other place in the news story. Other minor improvements in terms of optimisation and some bug fixes make the content editor a much better tool to work with. Superdesk, in its 1.0 rc1 version as released today, has just removed an age­-old wrinkle from the journo/tech relationship. It’s put the control in the hands of those who should be exercising it. It lets your producers and editors realise their vision and give their customers/audiences better products. This is business as usual for Superdesk. You want control, flexibility and power in your hands. We give it to you ­and when a feature is developed for one of our media partners, it’s available to all of them. We think that this makes sense and we’d like to make the tools that your journalists want, too, so get in touch. Curious? Head to GitHub and nose around.